LOS ANGELES, October 11, 2018 – On Monday, October 8, 2018, former Navy Seal Dave Loeffler accomplished a “Big Swim” in 15 hours and 29 minutes for the first-ever swim from San Clemente Island, CA to Catalina Island, CA. Loeffler, a trained marathon swimmer, was accompanied by highly trained professionals to ensure his safety and well-being as he faced the physical challenges of swimming for over 15 hours in the open ocean but also the environmental factors of swimming in 60-degree waters with the threat of Great White sharks. The Big Swim team and boat departed King Harbor in Redondo Beach, CA at 10 a.m. on Monday, October 8 to San Clemente Island. Loeffler began the swim at 10 p.m. that evening and swam directly to Catalina Island with an anticipated arrival of 10 a.m., Tuesday, October 9. Dave and team anticipated at 12-hour swim throughout the night, with calm seas, which would allow him to arrive in Catalina safely. As he approached Catalina, he encountered pods of inquisitive dolphins and a whale that tracked his progress. As the seas became progressively more difficult to navigate, the team was forced to reevaluate their landing spot to ensure his safety and that of those on the boat. Instead of a 21-mile swim, Loeffler ended up swimming closer to 25 miles in just over 15 hours and 29 minutes. This historic swim was canceled twice due to dangerous water and weather conditions like these, but this time he was able to persevere. After a short stay on Catalina, the crew headed back to Kings Harbor in Redondo Beach and arrived back about 4:30pm to a crowd of well-wishers and friends who came to honor this momentous swim. 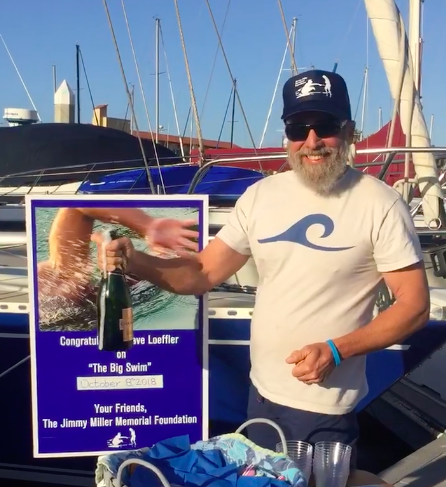 The goal of the swim is to raise money for the Jimmy Miller Memorial Foundation (JMMF) whose pioneering Ocean Therapy program combines adaptive surf lessons and group therapy for those suffering from mental and physical effects of traumatic experiences. JMMF conducts regular Ocean Therapy sessions with the Wounded Warrior Battalion-West at Camp Pendleton, CA and with veterans from all branches of the military in conjunction with the West Los Angeles Veterans Hospital. Taking on this swim was a perfect opportunity to call attention to issues suffered by disabled veterans and help raise funds for those that are serving our veterans like the Jimmy Miller Memorial Foundation. The Big Swim was sanctioned, observed and documented by the Santa Barbara Channel Swimming Association (SBCSA) and adhered to the basic rules of solo marathon swimming. The basic rules include that the swimmer can never touch the lead boat, kayak or another person and will remain in the water for the duration. Additionally, the swimmer can only wear a non-thermal single layer swimsuit, a swim cap and swim goggles – no wetsuit. The crew consisted of ultra-athletes, medical professionals, official observers from the SBSCA, photographers and Dave’s support team that fed him liquids and solids throughout the swim. Dave Loeffler is a former SEAL Team member who graduated BUD/S class 139 and served at SEAL Team 4. He is a service-connected, disabled vet and an employee of the VA hospital in Prescott, AZ. After his service, Dave became an open ocean marathon swimmer with experience in the Channel Islands and Lake Michigan. Dave is married and lives and works in Prescott, AZ. To request an interview with Dave Loeffler, contact Nancy Miller from JMFF at 310-266-0400.